The England international injured himself as he made a trademark, full-hearted tackle but still managed to shepherd the ball out of play before eventually collapsing to his feet and signaling to the bench midway through the first-half. After being replaced by Victor Lindelof , Jones pointed to his hip as he made his way past manager Jose Mourinho down the tunnel. The game turned on that moment, with United conceding a sloppy goal five minutes later, and Lindelof was culpable for both of Huddersfield's first-half goals in the 2-1 defeat. One slight consolation was that as United's subdued players made their way to the team bus after the game, Jones was walking without grimacing and did not look too downbeat. 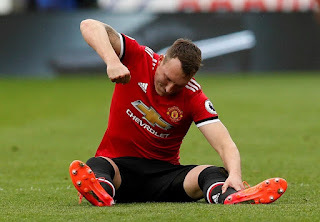 Jones has been at the heart of United's otherwise impressive start to the season, appearing in nine games to date, and has benefited from generally playing just one match per week. United currently have six players on the treatment table: Eric Bailly, Marcos Rojo, Michael Carrick, Marouane Fellaini, Paul Pogba and Zatan Ibrahimovic. Bailly is expected to return for next Saturday's huge clash against Tottenham at Old Trafford.